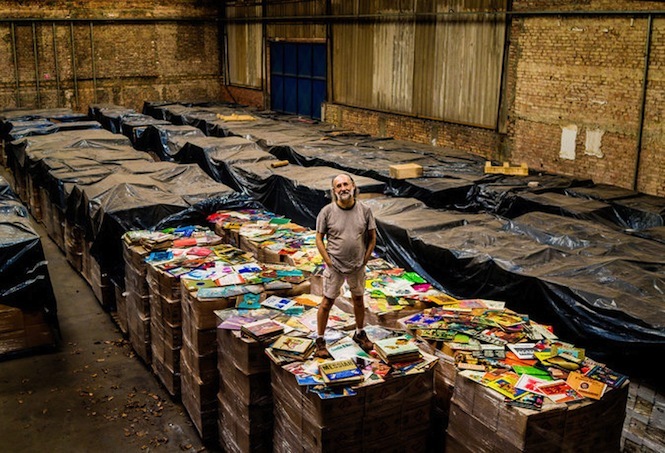 José Roberto "Zero" Alves Freitas (born c. 1955) is a Brazilian businessman whose record collection of over eight million discs is said to be the largest in existence. In addition, he has more than 100,000 compact discs. Jonny closes his eyes and thinks of a record he hasn’t played in a while before digging into a stack and pulling out reggae breakbeat LP by Paul Nice and DJ Wisdom called Beef Patty Breaks. He explains the history of the album cover, which features an iconic image of model Sintra Arunte-Bronte in a wet, red Jamaica t-shirt. This interview took place in two sittings, two months apart, in two different places. For the first session, Eilon and I met Spinna at his home studio in Bed-Stuy Brooklyn where his expansive record collection is stored in the “annex.” That was in May. The second session took place at his primary studio and record library, the Thingamajig Lab, also in Bed-Stuy. This was in late July and this time around, it was just Spinna and me.